A day on the beach is the third best thing to do in Lake Garda, so say the Tourist Coop of Valtenesi. * Considering that there are over 45km of beach, which amounts to almost one third of the coastline, it shouldn’t be too difficult to find one. The beaches aren’t quite the soft powder sand of the Caribbean, but the back drop is awsome and the panoramic views from most of the beaches are simply stunning. A cleaner, clearer and fresher body of water you will not find, just the tonic for cooling off on a hot Lake Garda summer day. The beaches are naturally made up of pebbles, although there are a few exceptions where the pebbles have been covered by sand, the best of these being just south of Lazise on the east coast. There are a also a few where the lake laps up onto grassed areas, whether or not these can be classed as beaches I’m not sure. Most of the beaches are public although there are private beaches belonging to campsites and hotels. There are also a few private beaches such as the Parco Baia delle Sirene which provide facilities such as childrens clubs, relaxation areas and ping pong tables. Also a number of bars/restaurants have aquired plots of beach, where you can rent sunbeds and you can indulge yourself in a true holiday atmosphere. Many of these such as the Baia Bianco and Nasimi Beach hold events throughout the summer months. That Lake Garda beaches are mostly made up of pebble does not mean that they are all the same, each beach has it’s own unique atmosphere, each with different things going on. Some are very quiet, with just enough room to lay out a towel, where you can just lay down, relax and top up your tan; others stretch along the coast for miles. Some of the beaches have jetties which protrude into the lake, perfect for sunbathing on and diving off to cool down. Some offer facilities such as water-sports, pedalo’s and kayaks, and for those who like a party atmosphere there are those with bars pumping out music. My personal favourites are Salo, where at the end of the day I like to sip my aperitivo and watch the sun slip down behind the mountains, or Portese, which has a pretty little port and a fantastic fish restaurant. Spiaggia Dusano, with its pretty port and walking routes that lead up to the Rock of Manerba, is also a beach I love to visit. *Valtenesi is the region of Lake Garda between Desenzano and Salo on the Brescian west shore. The map below is by no means the definitive guide of the Lake Garda beaches. I’ve tried a few but I’ve only been coming here for 18 years so haven’t managed to get around them all yet. It does of course show you where many of them are and provide as much information as I know or have been able to gather. But if in doubt, just drive around the lake, look out for for the brown ‘Spiaggia’ signs, follow them down to the lake and check them out to see if they are your kinda beach. 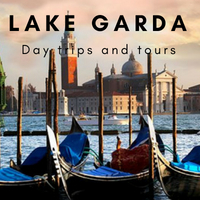 You wont need to check out too many or drive too far before you find a Lake Garda beach that suits you. Share Lake Garda beaches with your friends !